The still useable barracks for former prisoners and those for the guard detail camp were sold at the instigation of the French military government. The terrain of the former prison camp was returned to its owners for agricultural use. The French military government had a cemetery of honour erected in the spring of 1946 on the former premises of the SS guard detail. 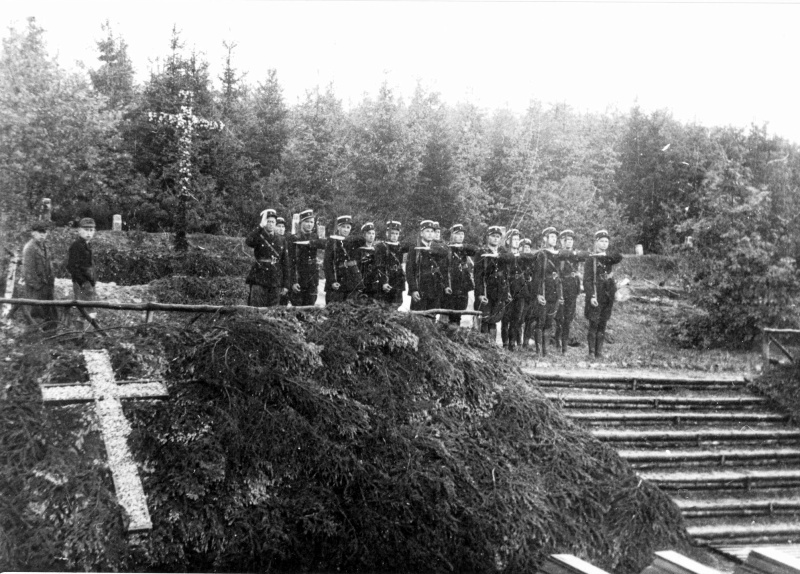 A French commission exhumed the victims from mass graves and from graves of the 'camp graveyard' hidden at the edge of the forest, where the SS would and had hastily buried the dead without identifying them. 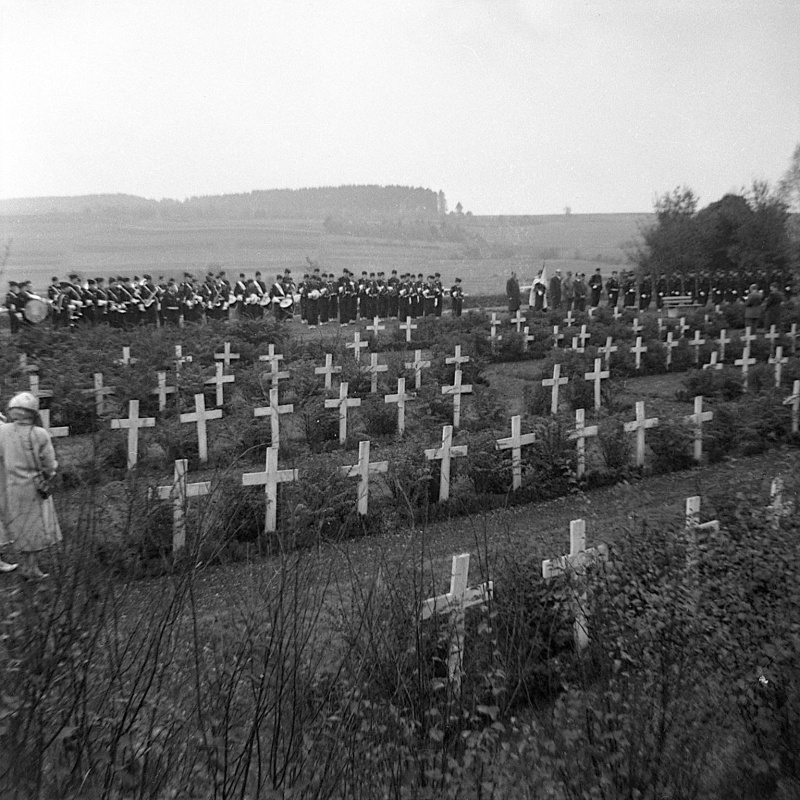 Identified French and Luxembourg victims were moved to graves in their homelands. The 217 dead who could not be identified or could not be transported to their homeland were laid to rest in a newly designed memorial cemetery. Simultaneously, at the initiative of the Beuren priest Fortuin, work was begun on a chapel that was dedicated to the victims on 4 November 1948. A bronze plate with the names and birthplace of those who died was added to the cemetery in 1960 where the wooden cross was replaced by a stone cross. The first commemorative plaque was attached to the cemetery chapel in 1982. Over the next few years two more commemorative plaques were added, one from Luxembourg and the other from France.The memorial from Lucien Wercollier was dedicated on October 1986 and is the central memorial at the cemetery. The graves were still adorned by wooden crosses in the 1950s. They were replaced by stone crosses in 1960. After the Federal State Central Authority for Political Education, on behalf of the State Government, prepared a concept for the memorial (1991/1992), it installed an information system in 1994 which shows the "Sites of Inhumanity" in the areas surrounding the former concentration camp and explains their historical meaning. In 2002, the Rhineland-Palatinate State Government made a unanimous decision to establish a documentation and meeting house next to the memorial. It was opened on 10th December 2005.